As the housing market struggles, many homeowners are electing to put off the buying and selling process until the market improves. Money that was set aside for down payments is now being used to improve the current residence. One of the most popular home improvement projects is renovating or replacing an existing deck. Depending on the original deck design, your first step is usually going to be the demolition process. For a ground level deck, this process is as simple as ripping lumber while standing on firm ground and cutting the deck sections into pieces small enough to safely carry away. On elevated decks, do not exceed the level of your expertise; deck lumber is heavy and unforgiving and once the supports are cut away bad things can happen, quickly. Either a worm drive or circular saw would be the most commonly used tool for cutting apart old decks. Here a Bosch worm drive Saw makes quick work of cutting through decking boards. The first cuts should be two parallel cuts between the decking joists and away from all nails. The decking joists are the 2 x 8s, 2 x 10s or 2 x 12s that run perpendicular to the deck boards on top. Joists are underneath and deck boards are fastened to the joists. Since most decks are built on 16” or 24” centers (distance between the joists), after cutting you should have an opening of 14” or 22” to stand in as you cut. These cuts are to allow you to stand on solid ground as you work your way along. As you make the second cut, the deck boards will drop away. Pick them up and remove them from the area to avoid safety risks and hazards that could lead to falls or much worse. Here you can see the first set of cuts that allowed us to stand on the ground beneath the deck and make our cuts without risk of standing on lumber that had been cut from its supports. Cutting through the first joist is the most hazardous. You can see the author making sure he is on solid footing on wood that has not been cut. The reciprocal cutting saw is another tool that can handle the joist cutting. 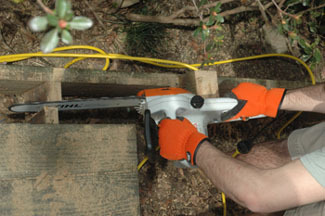 The Milwaukee Sawzall was used several times, because in some circumstances, it was the best suited tool. Also working around ground elevation, I would not recommend using your chainsaw where dirt might dull the chain. This deck had ground clearance on three sides. The fourth side had dirt built up around it and we used the Sawzall exclusively on this side. It is much cheaper and more convenient to replace a saw blade than to sharpen or replace a chainsaw’s chain. Also, if nails might be present, use the reciprocating saw. Many times, nails are hidden from view on old decks. Know this before beginning. Here, the Sawzall is being used to cut through the nails attaching the deck boards to the outside beam. Note the use of safety gear. Also notice that the extension cords are kept well clear of the tool’s cutting blade. Here you can see the well used metal cutting blade after cutting through the beam nails. Milwaukee refers to its metal cutting blades for its Sawzall reciprocating saw as TheTorch. As you progress with your cutting, take out small pieces, and pay extra attention to extension cords. Also, be sure and use extension cords rated for the tool you are using, too small of a cord is hazardous and could cause a fire or tool failure. Once you have removed the decking boards and have removed the beams, you will be faced with post removal. Deck posts are the vertical structural lumber to which beamsattach. Posts can be 4 x 4 or 6 x6” or metal. This area could be the most difficult stage of the demolition, however, I have removed decks where the posts were not in cement or attached to a footing, but were merely sitting on a brick. If the posts are firmly set in concrete, you may be forced to break the concrete apart before removing. Occasionally, you can remove the footing by working the post back and forth, loosening the soil around it and the concrete may be light enough to be removed by several helpers. If you need to break up the concrete to remove it from the posts, you can use a demolition hammer or even a chipping hammer depending on the amount of concrete that needs to be removed. Here you see the Hilti TE-95 breaker hammer and how it destroyed the concrete used to support these posts. A breaker hammer speeds up this task. The above posts were free of concrete within five minutes. A large jackhammer would have worked, but would have been overkill. The Hilti Breaker and the Bosch 20 Pound demo hammer were just right for this task. Once you have removed the concrete from the area, it is a good idea to spend some time cleaning up. Nails and screws will probably be scattered throughout the site. And if you have boards with nails, bend the nails over or remove them entirely. You are now set to begin your new project, whether it is a new deck or possibly a patio. I save some of the used deck lumber to build supports for posts while concrete sets shorter pieces for batter boards. Depending on the condition of the wood, there is likely to be enough good lumber to be used in other projects around the house. But be certain the wood is pest free and in good structural condition before reusing. All that is left for this project is to clean up, remove the old ledger, repair damage underneath the door and reread that article about why flashing is so important.